In the last tutorial, you learned how to access all REST-Endpoints provided by the ApiOmat. But sometimes you have to use REST-Endpoints provided by other servers. As an example, we will use the free pokémon-Api at http://pokeapi.co/ . The page provides a REST-Endpoint for querying pokémon data, like data about pokémon, items, regions etc. For example, if you want to have informations about the item "poké-ball", you can adress the "poké-ball"-resource via the URL http://pokeapi.co/api/v2/item/poke-ball . The information about the poké-ball is then returned as a JSON. Let's suppose the following use-case, keeping in mind the shopping list we have been building in this toturial. Every-time someone enters the a product with the name "poké-ball", the Module should automatically connect to the poké-api to request the price of the poké-ball. 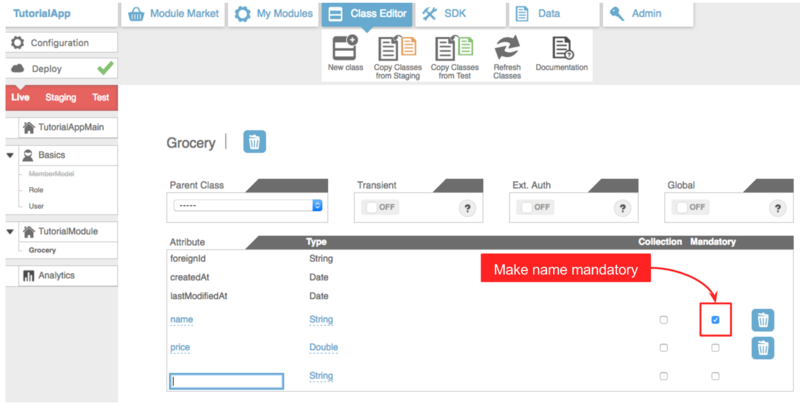 First, change the "name"-attribute of groceries to "mandatory" so that the user is forced to enter a name when a new grocery is created. You can do that easily via the dashboard. Your module-code should already be downloaded and integrated into eclipse. 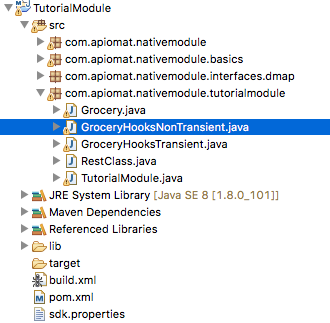 Go to the "GroceryHooksNonTransient"-class . This method can be used to download the data inside the body of a html-response. Now, alter the "beforePost"-Hook, so that everytime a new grocery with the name "poké-ball" is created, the resource "http://pokeapi.co/api/v2/item/poke-ball" should be requested in order to access the price of the poké-ball. //if the name of the newly created grocery is "poke-ball", download the information about the poke-ball from the poke-api. 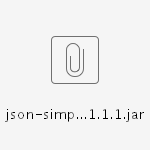 Copy this jar into the lib-folder of your Module. Then right click on it, and choose [ build-path > add to build path ]. 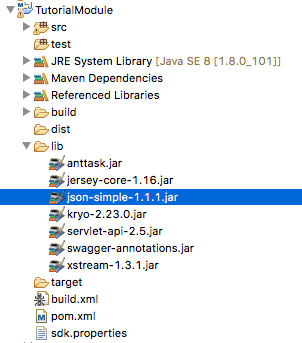 Now, you can access the methods provided by the JSON.simple-library to parse the JSON provided by the api. You're almost finished! Upload the module-code. And try it out! Now, when you enter a new item with the name "poké-ball", the price should autmatically be set by the price provided by the external API, which is 200!